Welcome to Musical Appreciation. If you were to ask what band was more influential to music, you might get a variety of answers: Beatles, Beach Boys, Led Zeppelin, AC/DC, Nirvana, etc. Another band that’ll get mentioned is The Who. In the 60s and 70s, they were known for on-stage antics like destroying their equipment and being responsible for more than a handful of classics. The Who help defined what it means to be a rock band. Another thing they’re known for is the rock operas Tommy and Quadrophenia, which were adapted into film. They embraced the artsier side of rock as well as its primal punk side. Today’s Musical Appreciation is one of their more well-known songs that people know today. This is Baba O’Riley. This song’s instrumentation is epic, starting with a repeating keyboard, played by Pete Townshend as the intro. Then that iconic piano riff kicks in. Then comes Keith Moon’s drumming and John Entwistle’s bass and Pete Townshend’s guitar work. And before the song ends, we get a violin solo from Dave Arbus followed by a bluegrass-like breakdown. This is one of those songs that gives me chills listening to it because the instrumentation is that good. Roger Daltrey dominates the vocals of this song. He put a lot of raw passion into it. Pete Townshend also gives us this middle eight. For so long, some people thought this song was called Teenage Wasteland. I know because I used to be one of those people. Can you blame us, though? The phrase “teenage wasteland” is mentioned more than once in this song and the phrase “Baba O’Riley” isn’t mentioned at all. Speaking of teenage wasteland, this song shows the generational gap between the young and the old. The older generation is very hesitant about the ideals of the younger generation and finds themselves in a place that looks and feel alien while the younger generation wants to live life before they grow old and are unable to do the things they want to do. Fun fact, this song was originally written for the rock opera Lifehouse, which was gonna be the follow-up to Tommy, but it was cancelled and this song, along with several others, would make up what would be The Who’s fifth studio album Who’s Next. 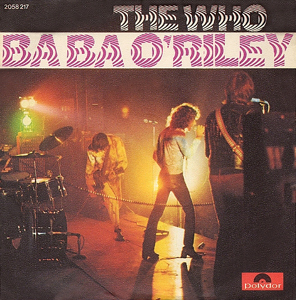 Even though, like I said, Baba O’Riley has never been released as a single in the U.S. and the U.K., it remains a Who staple. It’s been played at sporting events, featured in commercials, and receives constant spins on classic rock radio. Goes to show that the charts don’t always define what the classics will become, so don’t sweat it when some of your favorite songs aren’t burning up the airwaves or have hundreds of millions of streams. Chances are, people will eventually catch on. And that was Musical Appreciation. Next time, we’ll be looking at The Wall. What would have been worth noting is One Direction sampled the song’s beat in 2013 for Best Song Ever. Thoughts on that hit?